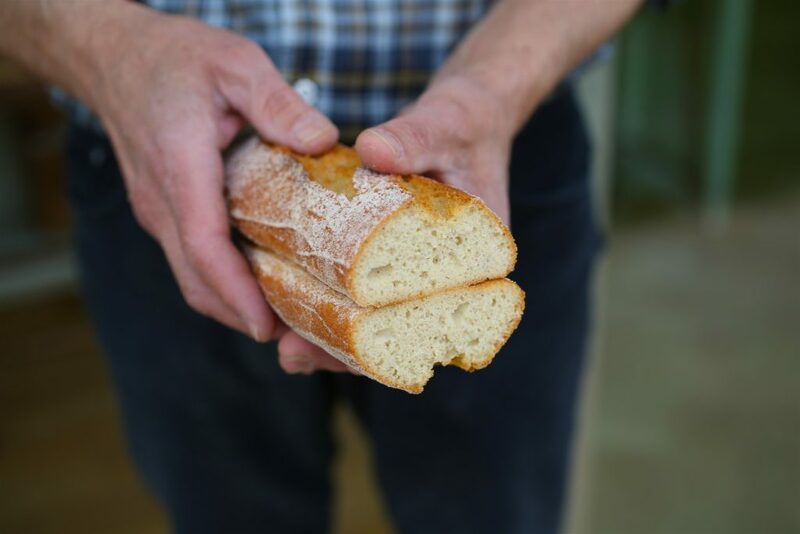 Gluten Free Sourdough French Baguette- Egg & Dairy Free | Jovial Foods, Inc. Gluten Free Sourdough French Baguette- Egg & Dairy Free | Jovial Foods, Inc.
We could eat many slices of this bread, and still crave more of the crispy crust and soft crumb. The combination of sourdough and ancient grain flours, along with baking the bread in an oven filled with steam, creates a crusty French Baguette that tastes authentic.The recipe is not necessarily difficult, but you will need to develop a sourdough starter, and mix up a batch of levain 6 to 8 hours before creating the final dough. Once you get used to the timing, it will be easier than you think to get the aroma of freshly baked French bread in your kitchen. In a large bowl mix together the levain and water. Add the flour and sprinkle the salt on top. Mix together until all of the flour is absorbed. Add oil and mix until the oil is incorporated. The dough will be very soft. Cut a 16-inch long piece from a roll of parchment paper and cut it lengthwise into two strips measuring 7 x 16-inches. To shape the first loaf, use a large serving spoon to scoop half of the dough in the shape of a 12 x 2-inch baguette on one of the pieces of parchment paper. Use an off-set spatula, to shape the loaf and smooth the surface of the dough. Repeat with the rest of the dough. Dust the top of the loaves with flour. 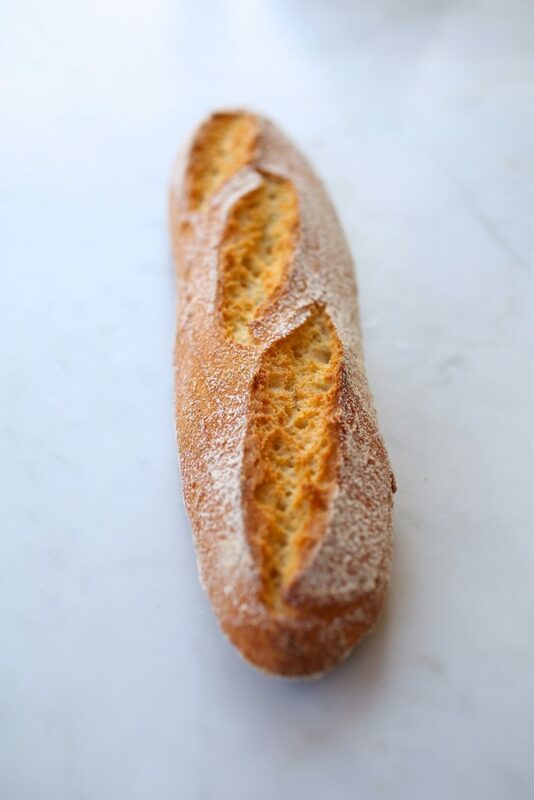 Cut three 3-inch-long slashes in the top of each baguette at about a 20-degree angle. Lightly cover with plastic wrap and let rise for 1½ hours. The slashes will widen when the loaf has risen to the right point. Preheat the oven to 450°F for 30 minutes. When the loaves are ready to bake, carefully add 1 cup of ice cubes to the bottom baking sheet. Close the oven door and wait 4 minutes for the steam to develop. Carefully remove the hot baguette pan from the oven. Lift the loaves up by the edges of the parchment paper and place them on the pan in the two outer forms of the baguette pan, leaving a space between the loaves. Place the pan in the oven and bake for 50 minutes until they are a deep brown. Transfer the loaves to a wire cooling rack and cool the loaves completely before slicing, about 2 hours. Notes: Baking the dough on a baguette pan helps to create a nice shape in your loaves, but you don’t have to run out and buy one to try this recipe! You can shape the baguettes on parchment, as described in the instructions, and secure the shape with the help of aluminum foil. Instead of preheating a baguette pan, insert a baking sheet in the middle of the oven when preheating. Bake the baguettes in the aluminum wrap supported parchment on the hot baking sheet. Be sure follow the instructions on how to create steam in the oven, because it will give the bread a crispy crust. I’m so excited about these gluten-free sourdough recipes! I really hope that you consider developing other recipes that use the gf sourdough starter, such as for pancakes, biscuits, and rolls. No worries, we have many more gluten free sourdough recipes coming. I’ve never seen a rimmed baking sheet with rims taller than about 1/2″. Did you mean to use a roasting pan? And if the pan is already filled with an inch of water, wouldn’t the oven already be filled with steam after the pre-heating period? Why is it necessary to add ice at this point?